This literature review was prepared by Judith Edstrom, an independent social development and governance consultant and adviser to the Partnership for Transparency Fund under the Leadership, Management, and Governance Project, a USAID-funded program to collaborate with health leaders and policy makers being Implemented by a consortium led by Management Sciences for Health (MSH). Engaging Citizens in Health Service Delivery summarizes the current findings on citizen engagement instruments in health service delivery and examines whether these interventions have contributed to enhanced health practices and ultimately on improved health outcomes. The inclusion of citizen engagement in development programs, including those supporting the health sector, is based on the premise that giving citizens a voice will help ensure that programs are tailored to their needs, will build a greater sense of ownership by the community, and will make service delivery more accountable, all of which will contribute to more effective service delivery. Earlier generation health projects emphasized training or information (“talking at” individuals or communities) to induce behavior change and to thereby improve health outcomes. These are now giving way to more focus on empowering citizens to take responsibility for their health decisions and practices, to collaborate with health providers, and to hold providers accountable for increased access to and quality of health services. 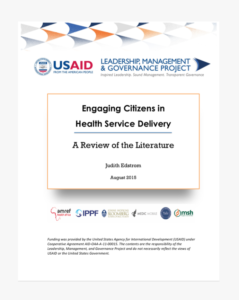 Reviews of evidence of impact of citizen engagement instruments on health service delivery and health outcomes are consistently cautionary in drawing conclusions regarding the impact of any single citizen engagement instrument or even a group of instruments. Moreover, because programs generally employ a variety of citizen engagement mechanisms concurrently, such as health committees or groups and structured feedback mechanisms like scorecards or grievance redress mechanisms, outcomes are generally not attributable to any single citizen engagement instrument. These limitations notwithstanding, research evidence confirms the potentially positive, although variable, impact of citizen engagement on health outcomes, but generally only when they complement a broader package of services. Successful interventions usually focus on raising community awareness of targeted health issues and encouraging dialogue and community ownership. Building and sustaining trust within the community was often cited as an important contributor to successful outcomes. The literature also reveals that outcomes are highly contextual, based on socio-economic and cultural factors and the overall enabling socio-political environment. Many well-intended initiatives to engage citizens fail to gain traction due to information and power asymmetries between service providers and citizens, resulting in elite capture or neglect of poorer community members. Other challenges to effective citizen engagement relate to lack of government capacity for oversight and downward accountability, project design that fails to understand the local context, and inadequate implementation monitoring. Key factors that have contributed to overcoming these constraints include buy-in by political authorities and agencies responsible for service delivery, a propitious enabling environment in terms of a national framework that embraces citizen involvement and presence of dynamic CSOs/NGOs, and an appropriate project design that tailors interventions to local contexts. Inclusion of dedicated citizen engagement monitoring indicators in projects, as well as strong operational guidance and support during both project design and implementation, are critical to building meaningful citizen voice to achieve improved health service delivery and health outcomes.